The first thing I love about hope in a jar by Philosophy is the packaging. It’s really simple – chic and I just love that it’s monochrome too. It’s a moisturiser which is suitable for many different skin types and does far more than your usual moisturiser. With claims of reducing fine lines and wrinkles as well as restoring tone and balancing the skin, you can afford to ditch some of those other ‘wonder products’ clogging up your daily routine. The key ingredient is alpha hydroxy acid which works to gently exfoliate skin. Labelled as a high-performance moisturiser, I find after a couple of uses my skin feels ‘renewed’ and I notice that the promise of removing dead skin cells appears to be working. It’s not super cheap – at £34.50 for 56ml (from Philosophy here) you want to get the most out of your money, and know that a product works! Well the moisturiser is full of powerful ingredients – the Vitamin A within the moisturiser improves cell turnover and there are also fruit and botanical based ingredients like citric acid and lavender oil. The texture is airy, almost like a soufflé – and it spreads well on your skin. I use it after cleansing and toning in the morning, and I also usually apply my eye cream first too. If I’m having a sensitive skin day then sometimes it tingles – but for me I love this as it shows that its working! 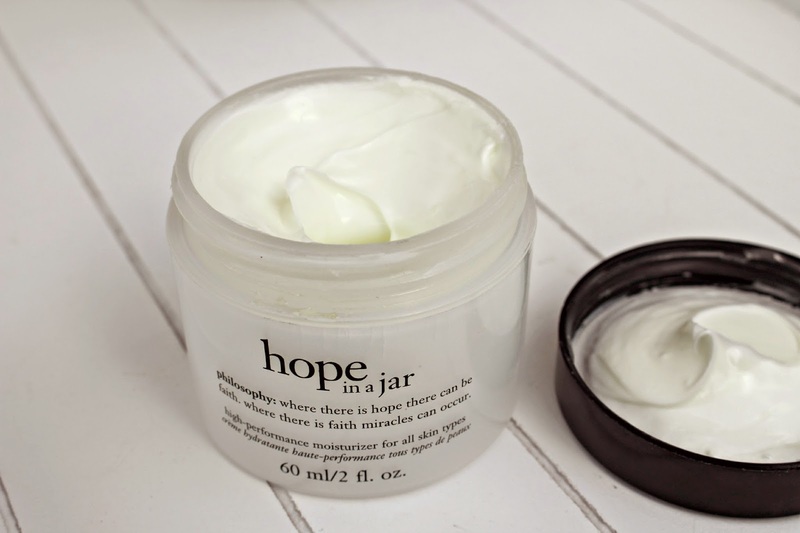 If, like me, you are feeling like you aren’t getting many extra benefits from your usual moisturiser, and want to add something with more performance into your routine then I highly recommend the Philosophy hope in a jar moisturiser. I’d love to hear your thoughts if you’ve tried it!